In 1981 I worked as an archaeologist at the Lowry Ruins, a Native American site inhabited about 1200 AD by the Anasazi people, now known as the “Ancestral Puebloans”. 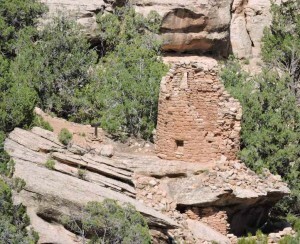 The Lowry Ruins are in Southwestern Colorado, a flat land with rich soil, carved in places with deep sandstone canyons. This strange landscape is made even more bizarre by the ancient stone dwellings which are still visible in shallow caves (alcoves) in the canyon walls. 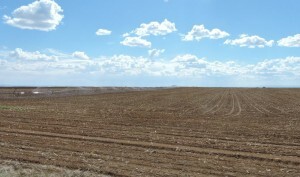 Modern farms dominate the flat lands and produce some of the finest pinto beans in the USA. But drop into the canyons and it is like going back 700 years to pre-Colombian America, when ancient Native Americans also grew beans, as well as maize and squash. One day in 1981, I happened to meet a Colorado bean farmer, who told me that in one of the canyons he found an ancient pot filled with a strange variety of beans. 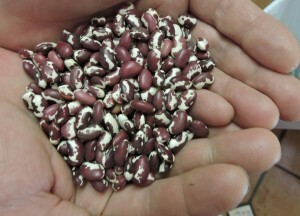 Being a bean farmer, he was naturally curious, so he planted a handful of the beans and they germinated. He harvested the beans and planted them again. By the time I talked to the farmer in 1981 he said that he had a whole acre of the beans and would soon have enough seed to plant a commercial sized field. 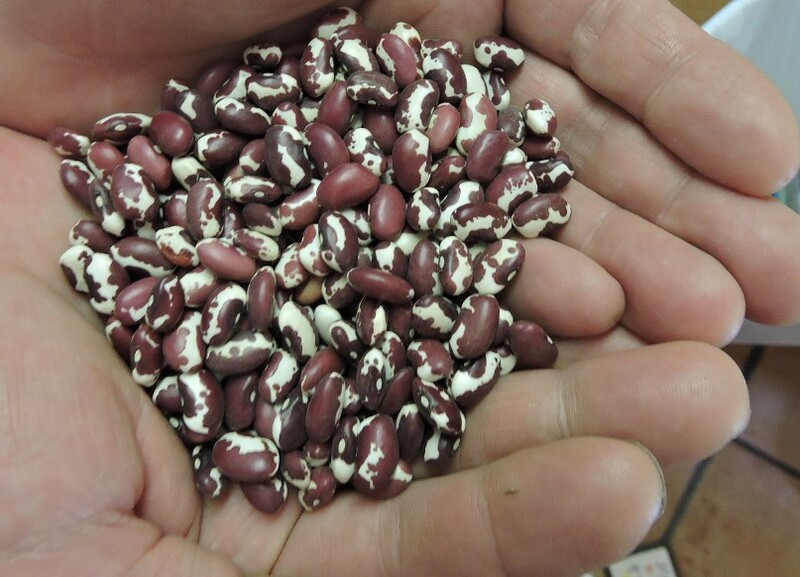 By 1983 a new variety of bean appeared in stores in the Southwestern USA under the name “Anasazi beans.” Unlike pinto beans, which are brown, these Anasazi beans were pale, with reddish speckles. I wondered if the beans in the shops were the ones the farmer in Colorado had told me about. I was back in that part of the world recently, visiting family, when my brother, Scott, went to the cupboard for a burlap bag labelled “Anasazi beans” and began to prepare them for supper. I could see that Anasazi beans were still popular with consumers, and for the first time in years I thought of the farmer with his odd tale of finding the beans in a ruin in a canyon. But this time I was more skeptical that bean seed could stay viable for 700 years, even in the dry Southwest. I wondered if the farmer I talked to in 1981 had found the beans in some more conventional way, such as from a seed catalog, or perhaps while on vacation in Mexico. By 2017, several companies were selling “Anasazi beans”. Scott’s bag of Anasazi beans came from the Adobe Milling Company in Dove Creek, Colorado, where I went with my brothers, Scott, Brett and Dan to learn more about the origin of the beans. Dove Creek is a small town and the Adobe Milling Company was easy to find. The store was surprisingly busy for a specialty shop in such a quiet place. The staff could hardly keep up with the stream of customers. I met Velvet Pribble, the lady in charge of this successful family business. Although the she and her staff were busy coping with a steady stream of customers, she still had time to chat. 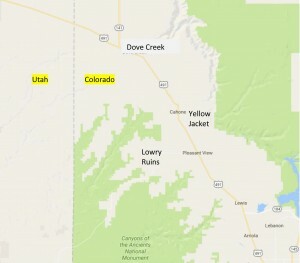 Velvet said that her great-uncle found the Anasazi beans in the nearby Lukachukai Mountains of New Mexico and brought them home and planted them in her family’s garden in Yellow Jacket (near Dove Creek). The beans grew and Velvet’s sister took the beans to school, for show-&-tell. The teacher, Bessie White, took some of those beans home and planted them herself. Ms. White shared the beans with neighboring farmers and then “they took off”. Velvet says that her family still has the original pot and some of the ancient beans, and that they look as fresh as the ones just harvested in Dove Creek today. “They never age,” Velvet adds. Velvet’s story puzzled me; her great uncle could not have been the farmer I met in 1981, because the two men claimed to have found the beans in different places. The Lowry Ruins are about 120 miles from the Lukachukai Mountains. Then I learned about other versions of the Anasazi bean story. 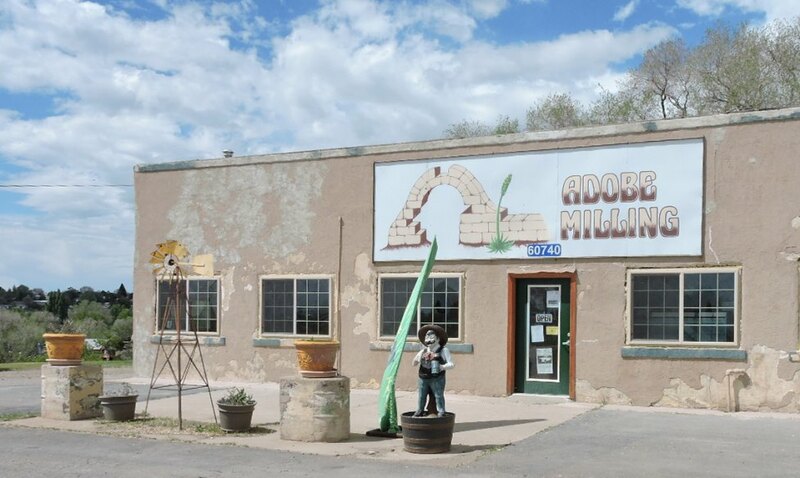 The pamphlet on display at the Adobe Milling Company itself says they beans “were found in the ruins by settlers to the four corners area in the early 1900s”, not that the beans were found by family members in the 1980s. To put the Anasazi beans in context, there are no confirmed cases where old seed, stored on purpose by ancient people, has been successfully grown by modern farmers. Legume seeds found in adobe (mud brick) from California and Northern Mexico were still alive after 200 years (Börner 2006), but this is some of the oldest viable seed ever found. Seed rarely survives for more than a century (Bewley and Black 2012). 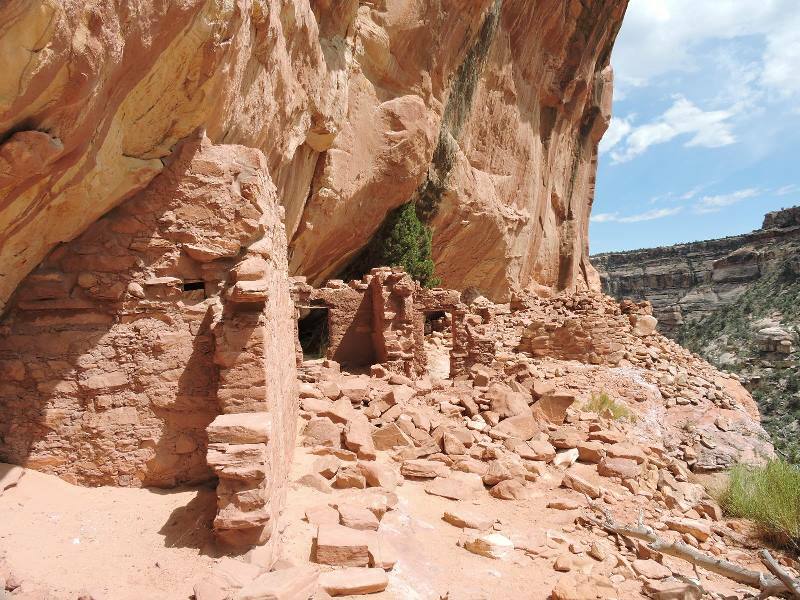 By 1299 AD, following a 27-year drought, the Anasazi abandoned their canyon homes on the Colorado Plateau, in the area where the states of Utah, Colorado, Arizona and New Mexico all meet. Centuries later, the area was settled by small groups of other Native Americans, the Utes and the Navajos. Anglo-American colonization did not start until the 1840s. 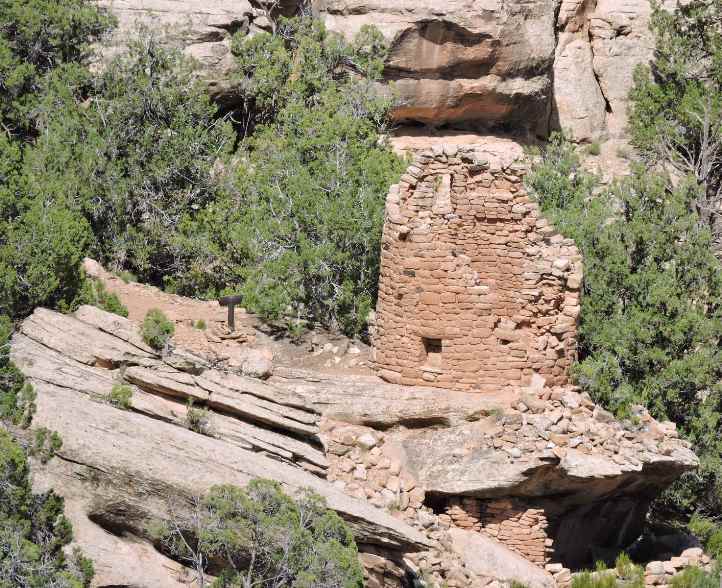 Parts of Anasazi country are still uninhabited, so great was the ecological collapse of the late 1200s. Seven centuries seemed a long time for bean seed to stay viable, so I phoned an old college friend, Winston Hurst, a life-long resident of canyon country, and an archaeologist specializing in the area. He told me that stories have been circulating for years about people finding beans in pots in archaeological sites. 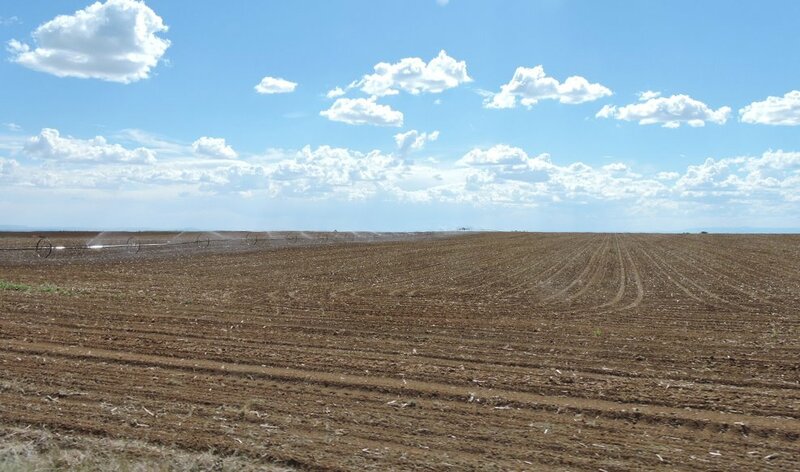 Winston explained that Utes and Navajos were growing corn in the region, but it is less clear if they were planting beans there. However, historic native North Americans usually grew maize and beans together, and the Navajos made enough pots to suggest that they could have been cooking beans. Several Navajo pots have been found in dry caves in Anasazi country. Winston recalls seeing three kinds of beans, which people claimed had come from ancient pots. Each bean was completely unique. One was the reddish “Anasazi bean,” while another was large and white like a navy bean, and the third looked a bit like a castor bean. So I offer the following hypothetical scenario: after the Anasazi (the Ancestral Puebloan) people abandoned southern Colorado and southern Utah in the late 1200s. Navajo settlers eventually planted gardens of maize and beans in the country, and left small caches of seed in pots in dry alcoves, perhaps even in Anasazi sites. These beans could have been less than 200 years old when collected by Anglo-American farmers, including Velvet’s great-uncle. Whatever their origin, the Anasazi beans are delicious. So drop in to see the friendly folks in Dove Creek, Colorado, or order some Anasazi beans on-line, because no matter where these attractive beans came from, they are a real treat to eat. Some local people in the Four Corners of Utah, Colorado, Arizona and New Mexico are now digging up archaeological sites for pleasure, forever closing a window on the past. Wherever you live, please respect ancient sites and leave them to the archaeologists, who know how to excavate a site professionally, to learn how ancient people lived and farmed. When plundered for its artifacts, an ancient site is not worth a hill of beans. The pinto bean and the Anasazi bean are varieties of the common bean (Phaseolus vulgaris). Bewley, J. Derek, and Michael Black 2012 Physiology and Biochemistry of Seeds in Relation to Germination: Volume 2: Viability, Dormancy, and Environmental Control. Springer Science & Business Media. Börner, Andreas 2006 “Preservation of Plant Genetic Resources in the Biotechnology Era” Biotechnology Journal 1: 1393–1404 DOI 10.1002/biot.200600131.